An excellent position for Black. He has the d-file and obvious targets at c2 and c4. An alternative to Rd2 is b5, which also targets the Bishop on c4 directly. It has nowhere to go. This is highly favourable to Black, and practically any White move loses material. In particular the squares a2, b4, c3 are all targets for the Knight on subsequent moves. 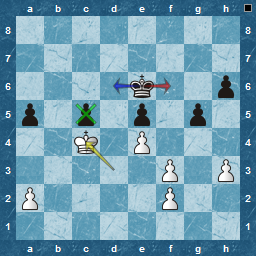 This really is a position that Black should win from with ease. 25...b6 if 25... Bb4 26. Nd6+ Ke6 27. Nxb7 winning material, is what I saw, but in fact the knight is trapped and the pawn has to be given back, with a probable draw. I should have analysed a little further ! 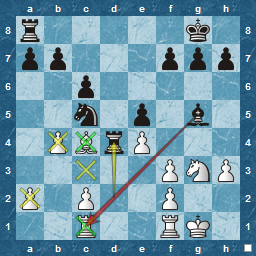 After this mistake, the result is sadly inevitable, and points to an serious endgame tactical deficiency. The error came about as I calculated that my King could reach and capture the h-pawn before White could promote the a-pawn. I did not take into account that it was easier for White to now ignore the a-pawn and push the e-pawn instead ! The natural 33...Kd6, protecting the c-pawn would draw. Overall a game to enjoy, but the mistakes in the endgame combined with the inaccuracy in the combination at move 19 means a loss, and not the result that I should have taken from the game. Tactics ( or possibly calculation ) is where the immediate solution lies, as the sharper moves at move 19 would have given Black a bigger edge, but this is an improvement on recent games. Very well played until move 19! I didn't consider the strong Bg5 move, which makes life very easy for Black. The simple 19...Rc4 is also good and very natural because you move the rook away from the danger zone and still another pawn. 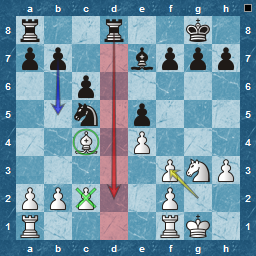 At move 28, moving the bishop to a5 saves the pawn but results in a perfect example of "good knight vs. bad bishop". Maybe it's worth considering to sacrifice the pawn and putting the bishop on a more active square? Just an idea, don't know if it works. Move 33 was an outright blunder. 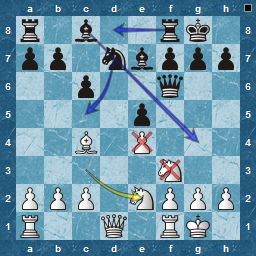 Your three pawns on the king side are capable of stopping White. After h6-h5 White cannot easily move the f-pawn nor the h-pawn anymore because you threaten to break through. Oh, one more thing. "Tactics" is not exactly right, it's rather the calculation skill that needs to be improved as well. At move 19, you can try to calculate the variations just 2 moves deep but as accurately as possible. You will quickly see that the text move is not the best. I think the tip with the "precise 2 move calculation" came from Charles Hertan. 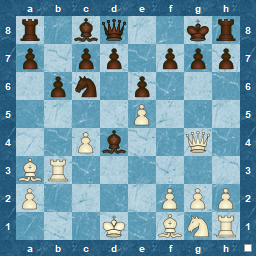 This doesn't really work in the endgame but in the middlegame it's a good rule. Starting from there you can calculate all forcing moves until the end, which obviously requires a lot of training from the aspriring chess student. I mostly agree with you and have amended the post accordingly. I can't remember who said it regarding publishing your analysis, but even though it is harsh to do and to see mistakes pointed out, hopefully it will have the desired effect ! By two move calculations I guess you mean for Black and White, ie 4-ply. I also recall a suggestion that you should always try to go one more move/ply just to see what else could be there. 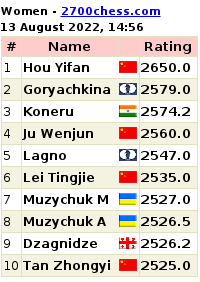 Difficult, but it would have paid off when considering Ba4 on move 25 for sure. One thing that I realise now, is that I subconsciously speeded up in the endgame, prompted by my opponent doing the same. It's good to see you in such an optimistic mood and that you are able to get something out of the game. The two-move calculation means 4 plies, yes. It's a good start, in the end you need to calculate forcing lines to the end but this requires a good visualization and will take time. When an opponent is Blitzing you, you have to resist, it's you against your clock so you should only think about your own time managment. Easier said then done of course, but easier on ICC than OTB where the pressure is even higher.